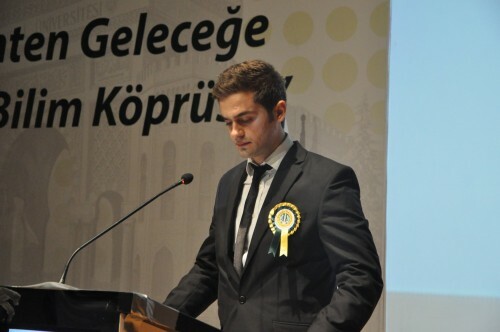 First ceremony was held at İU Centre Yard Atatürk and Youth Monument. 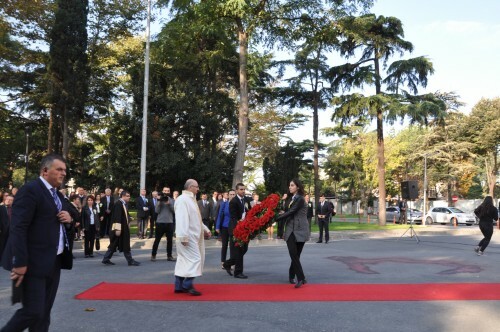 Rector of İU Prof. Mahmut Ak, laid wreath on behalf of İstanbul University. After stand in silence and Independence March, academic members and students passed to İU Faculty of Science Prof. Dr. Cemil Bilsel Conference Hall for the second ceremony. After stand in silence and Independence March, second ceremony started with the “İstanbul University 2015 Introduction Film” made by İU Press and Public Relations. 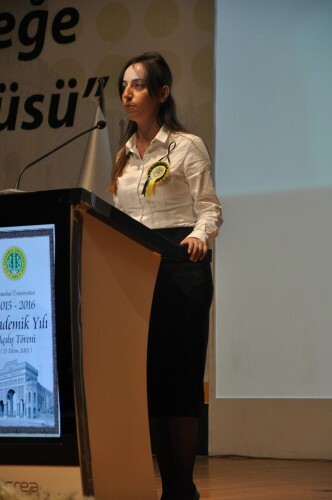 Firstly, student of İU Faculty of Engineering Sait Berber onbehalf of İU students and Research Assistant of İU Florance Nighingale Faculty of Nursing Emine Aktaş in behalf of research assistants went up to the rostrum. 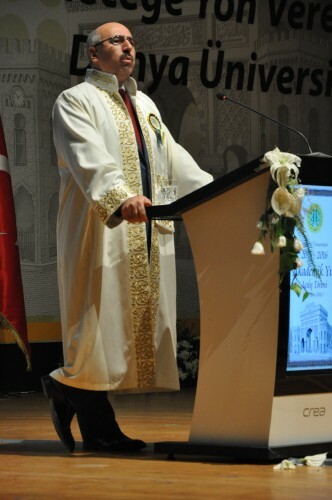 Rector of İU Prof. Mahmut Ak started his speech expressing that principles like “academic freedom”, “open sense of rule to shareholder”, “research-development activities and innovation”, “university-industry cooperation”, “internationalization”, “e-transformation”, “learner oriented education works”, “social integration”, “innovation of physical infrastructure”, “increasing administrative personal’s life standarts” cannot be compensated in the sense of rule. “İstanbul Universitya is an educational institution based on the date 1453 and reveals its rank among world universities. An institution that draw its strength from its technicality. In the previous days one of our İU Faculty of Medicine graduates Prof. Aziz Sancar filled us with pride having Nobel Prize in the field of Chemistry. The person who was educated in our country and won Nobel Prize is graduated from İstanbul University. Even this shows us how valuable tradition we have is. I am very happy to see scientists who worked on our country now works devotedly for the society in which they live. Another work we will hand down the young academicians is scientific tradition, the ambition of information and research like articles, books, theories, patents, inventions. So, there is a great mission for us, teachers to make young academicians better and maintain the scientific tradition academically. I think our university should stand out worldwide as a research university. Because from now on, period of change in a lot of fields like rapidly changing and transforming technology, new business fields, new discoveries on earth, healthcare field cause old information to become lost. There is a need for new information. This situation brings with new researches. We observe that new information is produced as a result of these researches. Our university takes big and swift steps in the way of being a research university with our support to research studies and structural adjustment for researchers. In our country, most application maker for patent is the Istanbul University in 2014 and İts studies related to patent is awarded by President. I want to share those data of studies with you. In the field of patent application, we are placed among other universities as the first one and ranked as 9th in all private and public establishments. Making the most patent application university in rankings, IU has become in first with 13 patents and has risen to 9th among the private and public establishments. In addition to accomplishments of patent studies, we have 74 TUBITAK projects belonging the year of 2015. We have made 465 applications in 2015 and 28 of this number has been accepted so far. Until the end of the year, this number will be raised. It is obviously seen that our university has taken a serious step in the field of research. We are continuing to support our research boards and researchers. As such a successful university at scientific researches, to encourage the students at undergraduate degree we start the project of ‘’Research for Innovator Students’’. We will provide our students to benefit from BAP support. This is one of the projects that excites us. Generally, we identify the youth just as university students, in our country. Whereas, we also need the youth who are’’ producing projects’’,’’coming up with a new idea’’, ‘’making scientific investigation’’, ‘’bringing the ideas action’’,’’ providing added value for society’’. We need to benefit from our youth’s energy and creativity more. The collaboration of university and industry is mostly seen in developed countries. As Istanbul University we have started the works with Istanbul Chamber of Industry (ISO). A presentation showing patented products is made for ISO in order to make patents turn into products; provide a source for Istanbul University and economy of the country. The collaboration works have been started toward ISO’s goals. IU Techno City is awarded as the best 3th improving technology development area, and has raised 16th rank in contrast with last year. In our technology transfer centre, we have started to take important step with cooperation of university, industry and society collaboration. We also take steps about the matter of consisting Thematic Techno city. Based on our university’s potential in healthcare field, the studies are started, in order to establish ‘’Healthcare Techno City’’. Even though the internationalization in higher education increased the communication and collaboration among the universities in many ways, the important thing is to make this process lasting and be able to carry it to the future with the projects in education and researching areas. Istanbul University which holds the Turkey’s multicultural structure, has a versatile perspective which is so important to be carried out all of these partnerships in a healthy way and make the communication real. We are working for fertilizing the diversity in our university in a working environment which is peaceful, gentle and free. We think that this effort should be an extra value in all the platforms we are a member of. The tripple mission of universities which is embodied as research, education and outreach by Coimbra Group, is a very important guide in front of us in this context. Work groups which is formed in the structure of Coimbra Group, are fundamental tools that transform this mission into reality together with its The Board Of Directors, Rectors Advisory Board and Administrative Office. Coimbra Group which consults many institutions and organizations in the field of higher education, is also a special structure that can reach students with scholarships and awards. This structure which is open to collaboration with universities in different regions of the world, contains fundamentals of internationalization in itself. We decreased our student quota for 2015. It will keep being this way every year. Our aim is to turn it into a structure which is based on graduate education and also a structure which provides university lecturers our universities need, and qualified employees the business world needs. We will increase both the number of our graduate students and their qualified works. We are aiming to educate them as scientists who are able to not only meet the needs of the era but also design the needs of the future, and also as someone who is able to solve the problems of our country and the world with a scientific perspective and with projects they’ve developed. So with this aim, we will make the necessary regulations which will provide our PhD students to produce at least one qualified scientific article which is obligatory during their doctoral studies. Except for our students own knowledge for making themselves successful, it is important to adjust new technologies and adopt themselves into rising sectors. Our university offers its students to do double major and minor programs along with the internship opportunities which will support the professional accumulation about their future job. This is a great opportunity for the students. They should put their theoretical knowledge into practise by doing an internship. In their last semester, students apply their knowledge gained in the university into business life during their internships. Our university enables this opportunity to its prospective students. This is an aimed project for this year. Accordingly, we organize an education program for our students in the faculty of forestry and engineering. We aim to show them the integration of their theoretical knowledge into the industry sector. In order to improve the quality of these faculties and to provide them job opportunities, we perform a program in which students spend their one semester in the industry sector. Consequently, they are educated in university for seven semesters and they do an internship for one semester. They will be graduated by this system. In addition to that the students who will continue their education abroad, they will have their bilingual degree – not the translation of it. We still work on this subject. On the other hand, along with the improvements in technology, there appears significant changes in the field of education. In this setting; we, as the academicians, should think about how to transfer and examine the knowledge in different methodologies. İU Sports Faculty and İU Transportation and Logistics Faculty were established in 2015. These two faculties will support the deficiencies of our country. We want to improve these two sectors so as to show the progression of our country. By that way, our country will be internationalized. The Project of “Digitizing the Unique Works of Art” is held together with Unique Works and Art Library. The digitizing has been started. Our project will be published on web in 2016 and it will become open to use. Our other project of “Alumni Pursuit” aims to gather the whole academic staffs, students and graduates on one platform. Finally, “The Corporate Communication” Project will enable us to reach our staffs in university via mailing and texting. Our corporate communication project is concluded. It will be used in every unit of İstanbul University in a short period of time. The mailing system is provided through Gmail. In 2016, for the sake of supplying safe, fast and nonstop mailing service, we will transfer our system to Google Mailing which provides freeware use for educational institutions. A big part of the restoration of the historical building of Istanbul University is completed. The destruction of the Biology Building has started. It is going to be constructed in a way that fits to necessities of the time as soon as possible. The new Çapa and Cerrahpaşa projects which are one of the biggest health projects of Turkey continues. 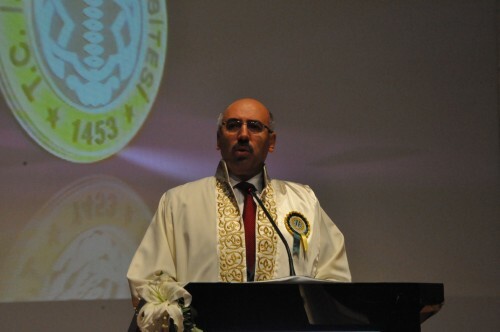 The groundwork of the two health compounds which contains one university hospital and one medical faculty in Istanbul is aimed to be started in 2017. The constructions are aimed to be done after 3-4 years of the starting time. As all of these projects are being conducted the necessary processes for the restoration of the historical building has started as well. The process for the protection and restoration of 4 buildings in Cerrahpaşa Campus and 8 buildings in Çapa Campus continues. It’s one of our goals that Avcılar campus to become ‘’student’s town’’. The structure of engineering faculty was completed. The new building of faculty of management is about to be completed. The restorations of the faculty of political sciences, the faculty of economics, the faculty of law and Kuyucu Murat Paşa madrasah have been continue. Maintaining all of these projects and works is a part of values which are our basic principles since we took office. With my wishes for to reach our goals together as Istanbul university, the longest-established educational institution in Turkey, I send my love and regards to you. 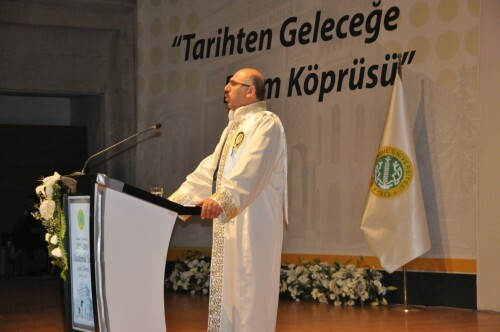 The opening ceremony of 2015-2016 academic year ended with the speech of the rector of IU Prof. Mahmut Ak. Around hundred people took charge in ceremony that held under the coordinatorship of IU Management of Press and Public Relations. The IU rosettes and special design IU cups presented to all attenders participated the opening ceremony of 2015-2016 academic year.